We were commissioned by Richard Knight from 5 point plus systematic strategy. 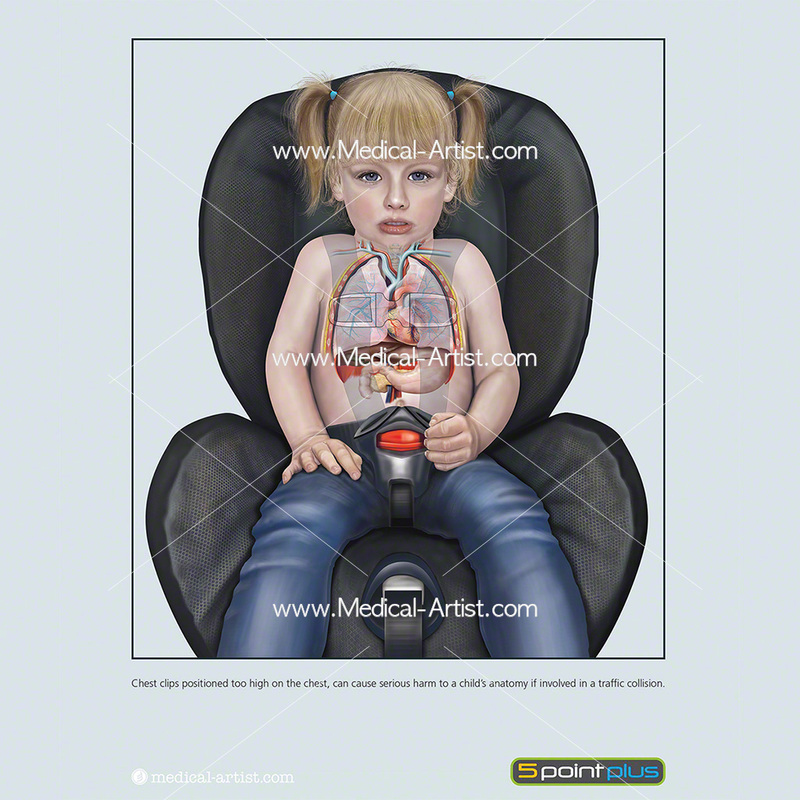 To create an illustration that would demonstrate the effects of badly fitting chest clips on children’s car seats to the internal anatomy on an child. It was to be used as public display material as part of a trade stand. The aim to draw the publics’ attention to the fact that a toddlers’ anatomy is delicate and even though a parent may think their child is safe in the current make of car seats when in fact they were not. What is the purpose of the chest clip? The objective of the car seat chest clip is to help prevent a child from getting their arms out of the harness and slipping the harness off their shoulders and children push their hands under the harness. Richard Knight wanted to demonstrate how the current chest clips on the market were ineffective at making child seats child proof, and needed to show how the hard bulky object introduces additional risks to a toddler in the event of an accident. It needed to show that it did not matter where the chest clip was positioned but that in the event of a collision, the chest clip would generate dangerous localized loads upon the underlying delicate child’s anatomy. A toddler’s rib cage is not strong, just soft cartilage and so would not offer any protection. 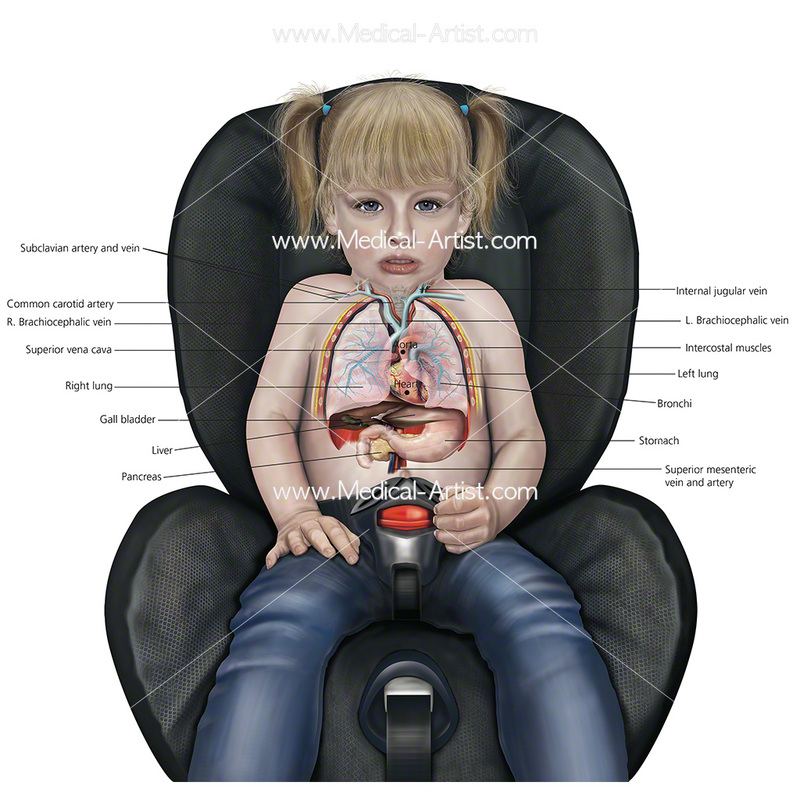 A bulky chest buckle on a child’s car seat is a significant factor in causing either thoracic or abdominal trauma in the event of an accident our aim. A toddler’s rib cage has not yet ossified and any trauma from a crash will penetrate through to the organs and arteries and not be dissipated around the rib cage. 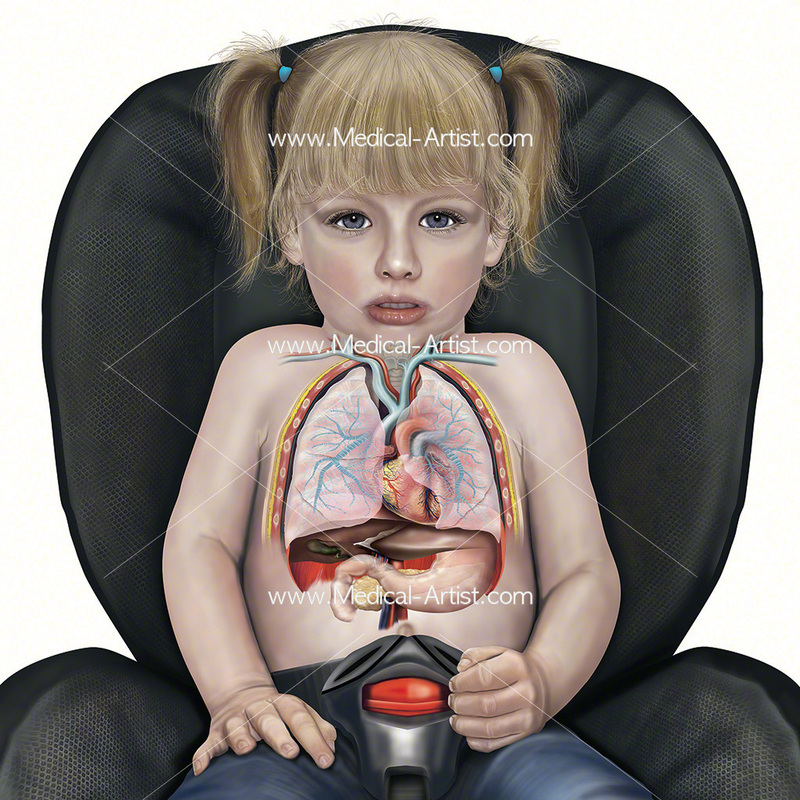 To demonstrate we illustrated a toddler sitting in a car seat using a ghosting effect to show the internal anatomy of the thoracic region and the seat buckle positioned over the top.